The global chocolate industry is focusing on broadening its portfolio of product offerings that can appeal to the evolving needs of health-conscious consumers. Inclusion of organic and natural ingredients in chocolates has witnessed steady demand over the years on account of growing awareness among end-users. There has also been a marked preference for white chocolates, as these are perceived to be ‘healthier’ alternatives to conventional chocolates. Manufacturers are stepping up their efforts by working on innovative packaging, developing products in a way to enhance shelf-life, improving distribution channel, and augmenting the nutritional value of their products. Leading manufacturers are working towards developing cost-effective and nutritional ingredients, as a result of which, the market for white chocolates is set to display a remarkable headway in the assessment period, 2017-2026. Rising awareness regarding the advantages of consuming white chocolates is leading to growing adoption, especially in the developed countries. 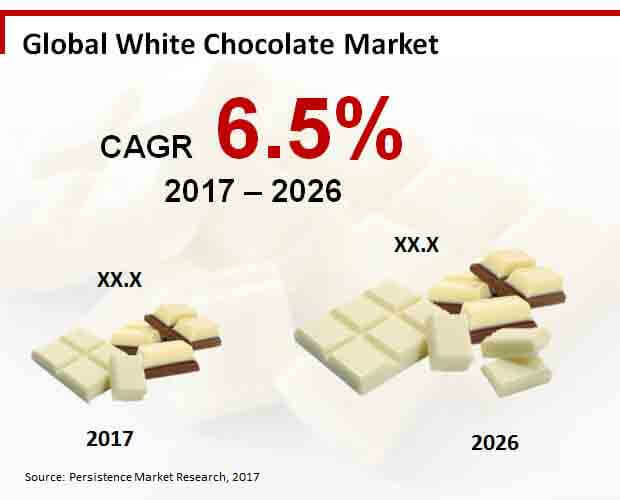 Even though the adoption rate of white chocolates is notable, there is yet lot of opportunity for further penetration of white chocolates in the chocolate industry. However, consumer preference for dark chocolates remains a key impediment to market growth. The global white chocolate market is poised to grow at 6.5% CAGR during the estimate period, 2017-2026. By the end of 2026, nearly US$ 23,509.4Mn worth of white chocolate will be sold globally, with North America accounting for the bulk of demand. Manufacturers have been using light-colored chocolate since a long time and stepping up their efforts by going mainstream. In the confectionary industry, adoption of golden hues is growing at a brisk pace. The toasting and deeper flavor of caramelized white chocolate has been trending amongst chefs and manufacturers. Use of caramelized white chocolate in making desserts is also creating new avenues of growth for manufacturers. In a bid to expand their consumer base, manufacturers are focusing on improving the nutritional value of their offerings, and position white chocolates as a healthy snacking option. White chocolate is perceived as a beneficial product for skin regeneration and hydration. Owing to its benefits in skin care, the cosmetic industry is incorporating white chocolate in their offerings. The trend of adopting white chocolate in skin care products is especially pronounced in face care segment. In addition to white chocolate, cosmetic companies are focusing on including bourbon vanilla and jojoba oil in their products to offer organic and natural solutions to consumers. Leading players in the white chocolate market are focusing on developing cost-efficient and new production techniques. Reduction of manufacturing costs and penetration into new application areas are the other key focus areas for manufacturers. Some of the leading players in the market include The Hershey Company, Mondelez International, Agostoni Chocolate, GCPPL Ltd., Chocolatiers (UK) Ltd, Barry Callebaut, Nestle SA, Blommer Chocolate Company, Ferrero, Ghirardelli Chocolate Co., Unilever and Mars Incorporated.